RFID (Radio-frequency identification) is software that uses a wireless non-contact system. Radio-frequency electromagnetic fields transmit information base from a tag attached to an object; this is for the purposes of automatic identification and tracking. The RFID Software here is offered under the SaaS (Software as a Service) model, meaning that the software is web based, hosted on the Cloud and can be accessed when needed through a client or web browser. If you’re looking for similar online software like RFID Software, consider our Warehoue Management or Logistics Software categories. 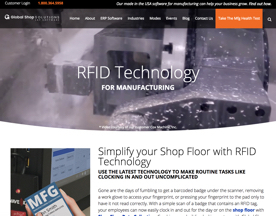 Simplify your shop floor with Global Shop Solutions RFID technology. Use the latest technology to make routine tasks like clocking in and out uncomplicated, while enjoying strong security and more accurate data in your ERP software.